Inset cabinetry is a time honored design. Craftsmen generations ago created fine inset cabinetry for their homes and select clients. Today, you can have the clean, distinctive lines of inset cabinetry, built with quality Fieldstone Cabinetry construction. 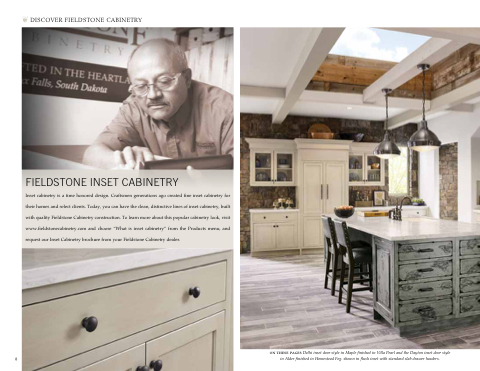 To learn more about this popular cabinetry look, visit www.fieldstonecabinetry.com and choose “What is inset cabinetry” from the Products menu, and request our Inset Cabinetry brochure from your Fieldstone Cabinetry dealer. on these pages Delhi inset door style in Maple finished in Villa Pearl and the Dayton inset door style in Alder finished in Homestead Fog. shown in flush inset with standard slab drawer headers.